My husband has been known to quote, "There's no such thing as bad weather, just bad clothing." This weekend proved the veracity of that statement. We'd planned a little getaway, looking forward to plenty of walking/hiking on the coast. The weather report was grim: wind, rain, cold, possibly snow. We packed lots and lots of gear - rain coats to wear over fleece jackets, cashmere sweaters, silk undershirts (me), rain pants, down vests, and down puffy coats. Hats, scarves, gloves. Good thing it was just the two of us! On Saturday morning we drove out to Sooke, to the southwest of the Island where the winds blow in freely from the Pacific. 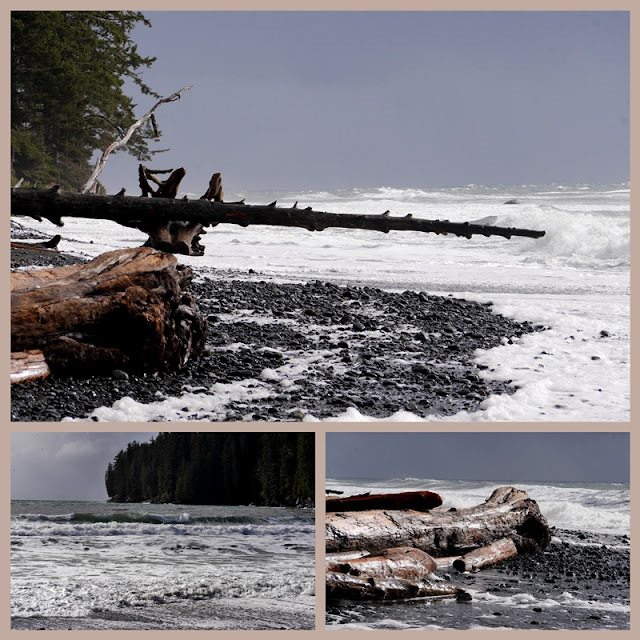 We walked along Whiffin Spit, a long, narrow curve of land protecting the Sooke Harbour from the wildest waves. Wind lashed the rain into our mostly covered faces, and blew us along the path. Coming back was a different story as we pressed against the wind to return to our car. The birds in the photos above didn't seem too bothered by the weather. The ducks bounced on top of the waves. Tim thought the group of four were probably on a double date. After eating lunch in a local bakery (fresh soup and bread), we drove to China Beach, one of the campgrounds along the Juan de Fuca Trail. After parking, and being surprised at the number of cars in the parking lot, we hiked down to the beach. About a dozen wet-suited surfers bobbed in the churning waves, waiting for that perfect moment to climb onto their boards and ride the ocean. Huge logs were tossed about like toothpicks. I wouldn't have wanted to be out there. When we returned to Sooke, we checked into our hotel and relaxed in the hot tub. Our concierge advised us to make dinner reservations immediately as they expected a lot of local people that evening because of widespread power outages due to the storm. Dinner was delicious - a Steak Sandwich (knife and fork variety) with salad and wonderful crispy fries for Tim, and Wild Mushroom Gnocchi with Spinach and Garlic Cream for me. We shared a Chocolate Pate for dessert - rich, intense chocolate ganache with a bit of fruit sauce and whipped cream. Sunday morning dawned cold and windy. Any clouds in the sky were soon blown away. A bit of snow blew around and settled here and there. We enjoyed the sunshine and blue skies while eating Eggs Benedict for breakfast. Well fortified, we headed out again. No more need for rain gear, but we were very glad for our down winter jackets. 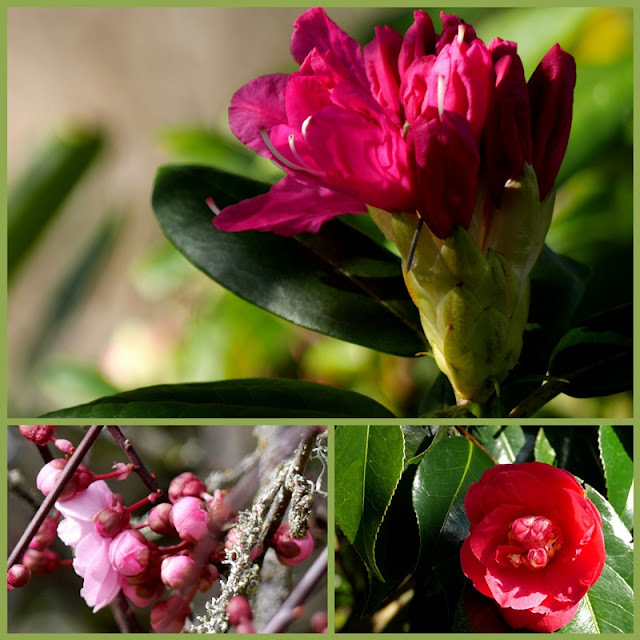 We visited the small, but pretty Ed MacGregor Park in Sooke, where the camellias and rhododendrons are just beginning to bloom. A long boardwalk took us down to the ocean again, and we walked along the Rotary Pier, then back up via another trail. A few brave cherry blossoms shivered in the cold. Heading home again, we stopped at Matheson Lake for another hike along the lake edge, so different from the sea shore. 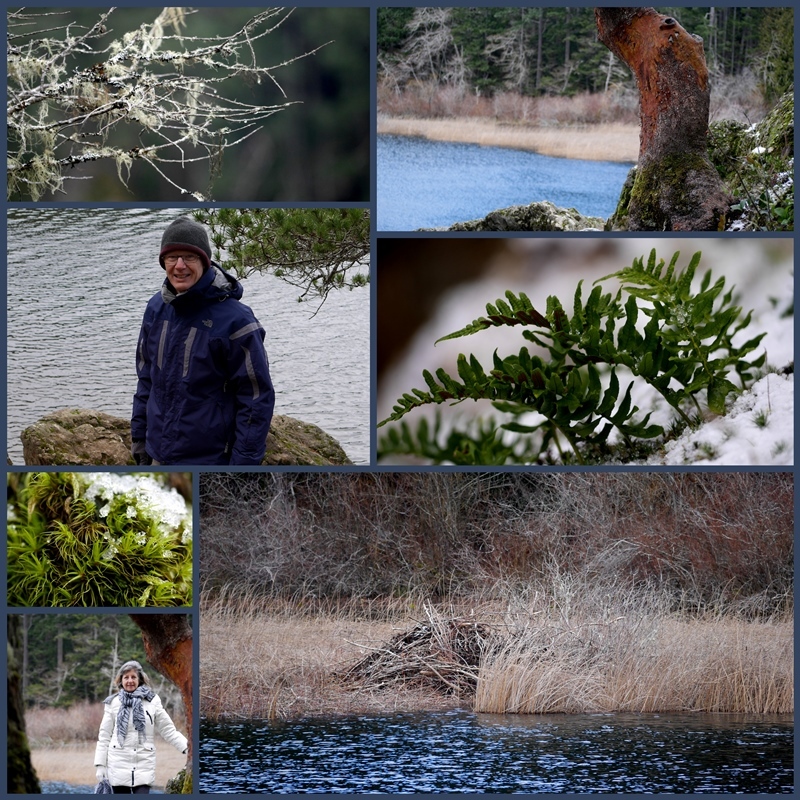 Ferns in the snow, an old beaver dam, and dry grasses coloured our views. Home again now, and I feel like I've had the loveliest break. There's something about going away from home to a place where nothing reminds me of things that could be done, and there are no meals to plan or laundry to do. It was just one night, but so refreshing. You packed so much (not only cold weather gear) into your getaway, thank you for taking us along with you. The scenery, despite the weather, the flowering shrubs, the wildlife - all wonderful and the hotel with it's delicious food the icing on the cake. Love the idea of double dating widgeons! A perfect getaway! I heard that VC has been under snow recently. What odd weather we are all having. They've had quite a bit of snow lately. We've missed it all, except for a slight skiff. It is great to have a few days away regardless of the weather and it always feels so much longer - a good reminder - time for us to do the same methinks. question in your closing. Glad that it was just what you needed. What a wonderful hike you had. There are so many things to see on your trail. Your mosaics with the birds and the ocean are lovely and I spotted you bundled up against the cold.The flowers is a lovely spring of sign. Your header is perfectly beautiful! I like those small buttons in your header and the blue color.Have a good new week. I admire the two of you for not letting the weather stop you. It would have been a shame to miss out on such a nice getaway. I enjoyed tagging along with you. The sights are so pretty. There is something "reviving" about getting away from home for a few days. Good for you! You didn't let the weather keep you away. Loved the idea the ducks were on a double date. 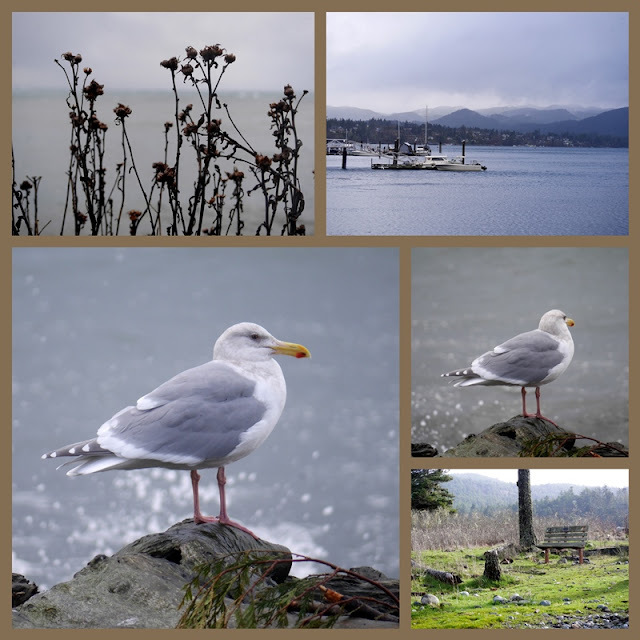 I love gulls -- so silly and so much fun to watch -- little rascals! Getting back to nature is what my Granny would have called "the cats pajamas"!!!!!!!! Happy Monday! I simply love your blog. This one touched my heart as I was born by the ocean in Lisbon, Portugal. I miss the sound of the waives and the smell of the four Seasons. Here In Canada it's not so easy to find. I like very much your photos. they are very expressive of the lovely get a way you had with your husband, Iam a city girl that loves nature. very beautiful sights. What a lovely getaway! I admire your tenacity in less than ideal weather conditions! What a lovely get away! I agree with you about getting away from the things that remind you of things you could/should/would need to do. A true break! Irish friends say “There’s no bad weather, just inappropriate clothing! Looks like quite an adventure. It's amazing how long one overnight can seem when you are away from the usual--so refreshing! Great quote! Yes, if one just dresses for the weather it makes life much better! I love seeing photos of your island. We spent sometime at Sooke and remember the area well. Love that quote from your husband...so true. How nice to get away and leave the everyday behind. Your post bought back lots of memories. 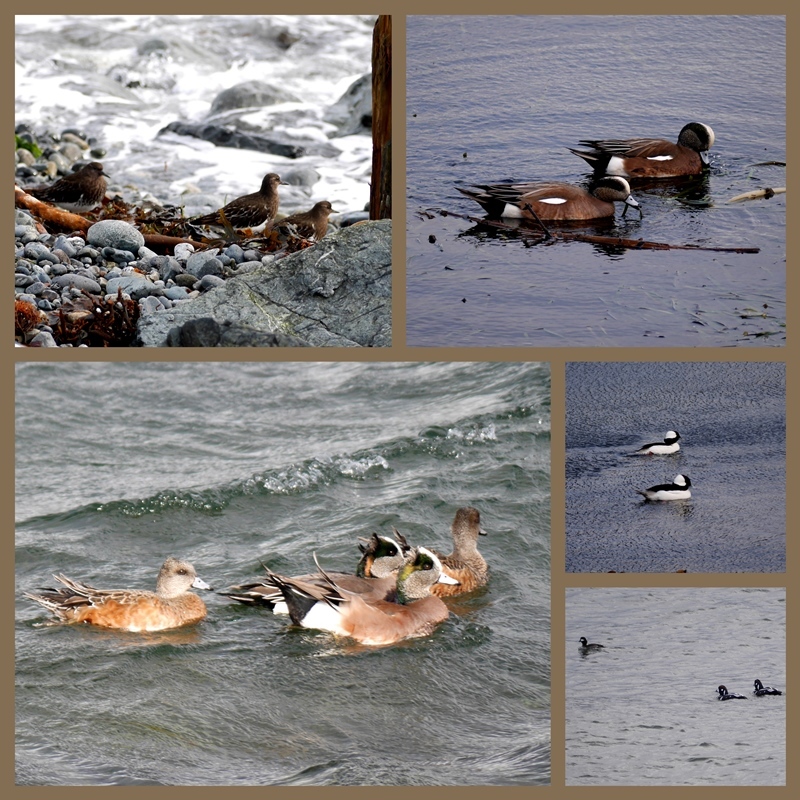 The last time we visited Whiffen Spit it was raining and very bleak but I got some lovely photos of the ducks and shorebirds. We love the boardwalk at the park and so many other things. There is a lovely yarn store in Sooke as well. Sounds like you had a lovely break away. I love trips like this and we always pack for everything too! Love your pretty scarf! Glad you had a nice place to stay and great food. It's refreshing to get away for an overnight! Hugs! Sometimes, a walk on a stormy day is exhilarating, as long as one is in protective gear, like you were. It's nice to have a little "get away" and I'm glad you did not let the inclement weather make you cancel. I love getaways like that!! Sounds just wonderful. Great duck pictures, and the walk sounded wonderful. I'm afraid I've lost the gene that allows PNWers to enjoy that kind of weather, but we certainly used to. (Maybe it's just the 'right clothing' that I've lost actually.) And the Pacific Coast cannot be beaten by anything anywhere for wild beauty and for the feeling of being in a private magical spot. Thank you for sharing the beauty and for the memories. Being from the UK (and used to rain every day), my hubby uses the same quote! Your worked in a lot of activities for your overnighter. My favorites are the shots of the waves crashing in to the beaches. And of course, you rocked the down jacket - they always look dumpy on me! I love the saying about no bad weather...must file that one away! OMG ...What beautiful pictures... The wildlife and greenery certainly warms ones heart. It looks like you had a lovely get-away. Nice quote as there is always sometime beautiful in every day of every season... Thanks for sharing. What a lovely get-away. Yes, even one night can be refreshing. We keep saying we would like to go to Sooke and explore, but have not done it yet. The weather lately is for sure changeable. One day to another we don't know what to expect. Today is snowing. That sounds like such a lovely getaway! Sounds like you were well prepared to enjoy the beauty surrounding you. Thank you for sharing with us, dear Lorrie. Hugs! What an enchanting trip. You were so smart to prepare for all weather. Yes, the quotation about weather and clothing is one of my favourites too. Your getaway sounds wonderful and the photos prove it really was. Camellias blooming... it's almost difficult to imagine such a joy! What a most lovely getaway, Lorrie, for you and Tim. The meals alone would be a fabulous break! Chocolate pate sounded so delicious. It's nice that you two felt refreshed, and did so much in that short time away. I guess that bad dressing makes it so much worse. I saw quickly when our kids moved to Saskatoon that they learned to buy the right clothing for the winter.